I grew up in a tiny, rural community in Southeast Missouri–in an area that is still called the Bootheel. Although I grew up in the town part of my small community, most of the area’s people lived outside the town’s limits–out on farms. In the Bootheel, tiny hamlets like Gideon formed around the schools that were established here and there to teach all of one area or another’s children.The farm kids were brought in to the schools on buses. A few of the farm communities even had a store or two. When I was very young in Gideon, there was a nice 1950s doctor’s office, a little department store, a dime store, a hardware store, a drugstore with a soda fountain, and an IGA grocery store. I could write an entire series of books about how my time in each of those places affected me–how they made me who I am today. Yet, all of those places are gone now. During the month of March, I always watch the 1952 movie The Quiet Man. It is director John Ford’s nostalgic and poetic return to the Irish home of his parents. The Ireland that Ford captures in his movie is a delightful but highly sentimental view of an Irish country life that has passed, but it is only partially based on reality. The Quiet Man is a romanticized version of a bit of reality. The Quiet Man movie was based on a story written by Maurice Walsh in 1933. At about that same time, and English woman Flora Thompson was writing a similar romanticized memoir of her country childhood in a small village near Oxford UK. I am studying Thompson’s Lark Rise to Candleford now. When I was a child, I was surrounded for miles by cotton fields, cotton gins, and the dark, rich soil that the Mississippi River had deposited there in earlier years. The top photo is what fall looked like where I grew up. The land there [in the flood zone of the Mississippi River], has soil that is so very rich that hardly any of it is wasted on trees. Where you see lines of trees, there is probably a small creek-like waterway that was long ago dug to catch the river, should it flood again. When I am being totally honest, I am forced to admit that growing up, picking cotton as a child was dreadful. It was only slightly better than the life of the chimney sweeps of the Charles Dickens’ England, but now I am 1,000 miles away from those cotton fields, ad they seem like home to me. 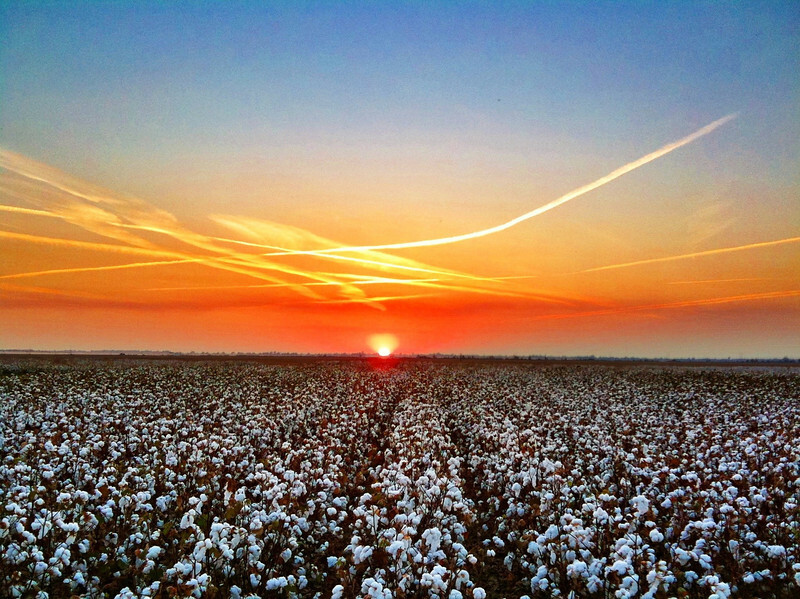 Even though I did not actually live on a farm, my childhood was determined by Cotton, and my calendar was punctuated by the various stages of its growth cycle. The winter was slow and quiet. The spring was an awakening time of planting, and summer was a time of growing. During the fall, the air was filled with cotton lint drifting from the cotton gins and compresses. The roads were lined with wagons going to and from the gins; and life became the everyday business of harvesting cotton. Farm people came to town on Saturdays, when they got haircuts, bought a few groceries, etc., and Sunday was Church Day. Like many other people, I thirst for a return of a homeland that I feel that I somehow lost along the way, but my hometown is not at all the same as it was when I lived there. For Southeast Missouri, things have vastly changed since the 1950s. Places that were once sweet, little communities are shadows of themselves–ghost towns now. My hometown Gideon’s one industry–the box factory–closed many years ago, and the stores followed in quick succession. Most of the town is boarded shut. Farming fell on hard times, too. Cotton is no longer the King there, but former Gideonites, my age and older, remember when he was. and we have a sort of existential yearning to return to the days of shucking corn on the front porch and making sweet tea. Certainly, we can still shuck corn and make sweet tea, but it is not the same. Things have changed. The towns of our pasts are gone, ad the children that we once were are also gone. Even if the houses where we lived as children are still standing, our homes are gone. “Some things will never change. Some things will always be the same. Lean down your ear upon the earth and listen. “The voice of forest water in the night, a woman’s laughter in the dark, the clean, hard rattle of raked gravel, the cricketing stitch of midday in hot meadows, the delicate web of children’s voices in bright air–these things will never change. “The glitter of sunlight on roughened water, the glory of the stars, the innocence of morning, the smell of the sea in harbors, the feathery blur and smoky buddings of young boughs, and something there that comes and goes and never can be captured, the thorn of spring, the sharp and tongueless cry–these things will always be the same. “All things belonging to the earth will never change–the leaf, the blade, the flower, the wind that cries and sleeps and wakes again, the trees whose stiff arms clash and tremble in the dark, and the dust of lovers long since buried in the earth–all things proceeding from the earth to seasons, all things that lapse and change and come again upon the earth–these things will always be the same, for they come up from the earth that never changes, they go back into the earth that lasts forever. Only the earth endures, but it endures forever.